E.P. Industrial Machine Lube With Soluble Moly (#203B) is a non-drip, extreme pressure lubricant that is specially formulated for the lubrication of slide and way systems, bearing applications, enclosed gears and gear stamping and machine presses that require a light to medium viscosity extreme pressure gear lube, and other machine tools that require a general purpose extreme pressure oil. E.P. 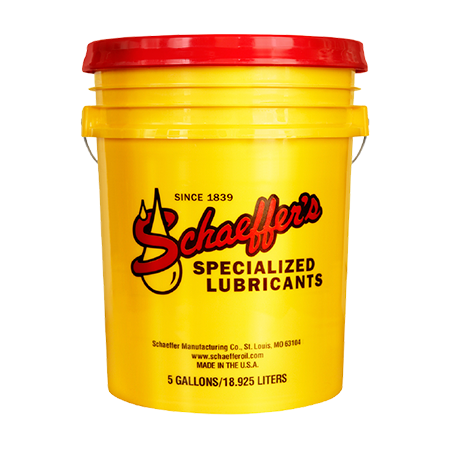 Industrial Machine Lube With Soluble Moly is blended from the finest solvent refined, severely hydro-finished, high viscosity index, 100% pure paraffin base stocks available. These 100% pure paraffin base stocks provide E.P. Industrial Machine Lube With Soluble Moly with excellent oxidative and thermal stability and the ability to lubricate over wide temperature ranges. Enhanced thermal and oxidative stability and durability to handle high operating temperatures. Excellent extreme pressure properties to protect parts from excessive wear, prevents premature bearing fatigue, gear scoring, spalling and pitting. Prevention of the formation of sludge and carbonaceous deposits that can erode seals and cause premature bearing and gear wear. Excellent protection of components especially yellow metal components from rust and corrosion. Enhanced protection of copper, brass and bronze components from corrosion in dry conditions and in the presence of moisture. Most gearing is designed to perform under hydrodynamic lubrication conditions. That is, a full fluid film must separate the metal surfaces of the gears during operation. However, during periods of cold start-up or severe shock loads this film can be destroyed. Unless a boundary lubricant is present in the gear oil when this full fluid film is destroyed, wear can take place. To prevent this wear Micron Moly®, a liquid soluble type of moly, is further blended into the product. The Micron Moly® provides the boundary lubrication needed by plating to the metal surfaces. This plating action forms a long lasting solid lubricant film on the metal surfaces of the gears. This moly film will withstand pressures up to 500,000 pounds per square inch, thus reducing wear and extending equipment life. The Micron Moly® also provides a smooth finished surface on all moving parts of the gears. This minimizes the action of cold welding, which can occur during start-up after the gears have been standing idle. This in turn lessen starting loads and peak power demand; thus a realistic power cost savings can be achieved. E.P. Industrial Machine Lube With Soluble Moly also contains anti-foam inhibitors, rust and corrosion inhibitors, tackiness additives and anti "stick slip" additives. It is, however, not recommended in those gearbox applications that employ the use of felt type filters or paper filters due to the tacky nature of this product. E.P. Industrial Machine Lube With Soluble Moly meets and exceeds the following specifications and manufacturer's requirements: Military Specification MIL-L-6086C, MIL-L-46017, API Service Classification GL-3 & GL-4, U.S. Steel 224, AGMA 250.04 and 251.02, David Brown S1.53101 Type E, DIN 51517 Part 3 (CLP), Cincinnati Milicron P-47, P-50, P-53, P-63, P-74.